For all those that have driven across Canada, you know how long it takes to get through Ontario. Well, it’s the same experience “leaving the north”… We feel we hit civilization aka Smithers, B.C. after 14 hours and many would still consider that being “in the north”! We hit the road on Tuesday September 4th and managed to make it out of the driveway only 45 minutes later than our target, which was pretty good considering all the last minute things that seemed to crop up. 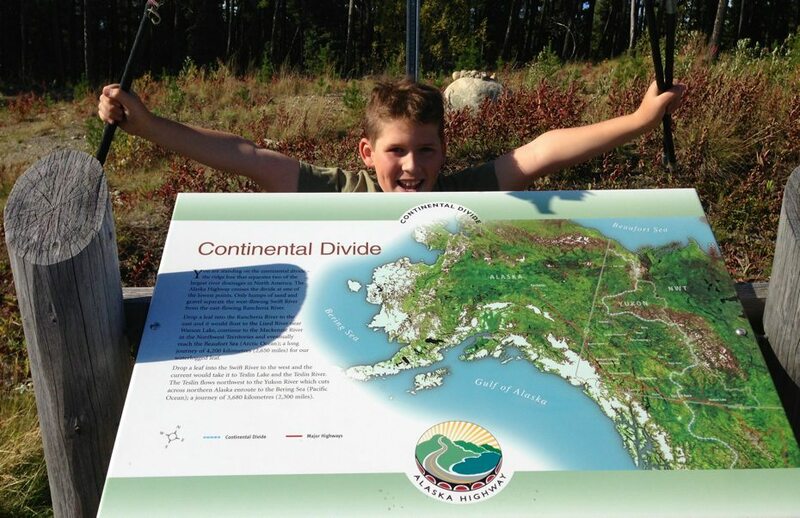 We are learning how to recognize “homeschool moments” and did some quick geography work when we came across this Continental Divide plaque just outside of Teslin, YT. We headed south on the Alaska Highway until just before Watson Lake where you turn right onto Highway 37 and start the journey down the Stewart – Cassiar Highway that leads into Northern BC. 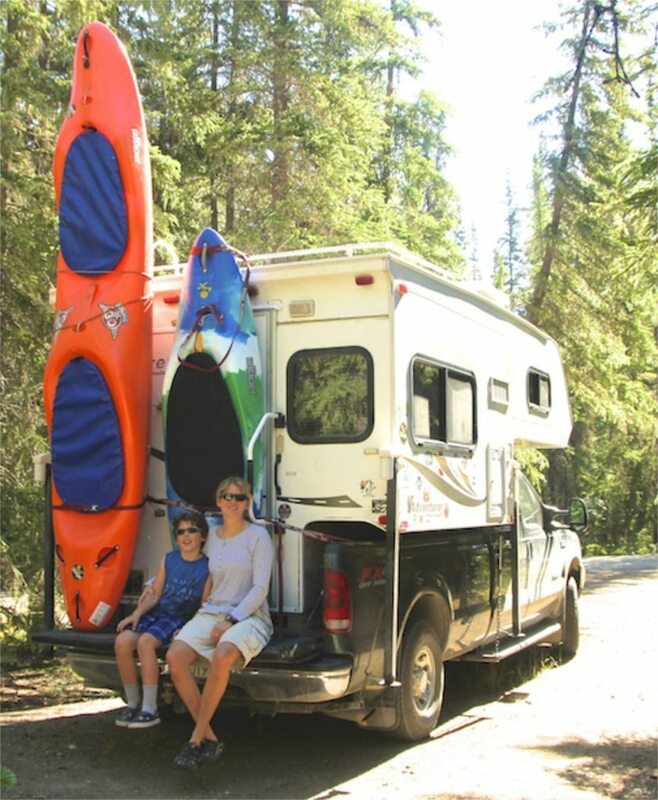 With dusk coming and smoke from a forest fire starting to settle in, we called it quits at Boya Lake Provincial Park in B.C.. A fabulous deal at $16.00 per night – nice play ground for kids, well treed camp sites, 1.5km wooded walking trail and a swimming dock for those hot summer day. Mount Mcintyre, Grey Mountain or Carcross?? 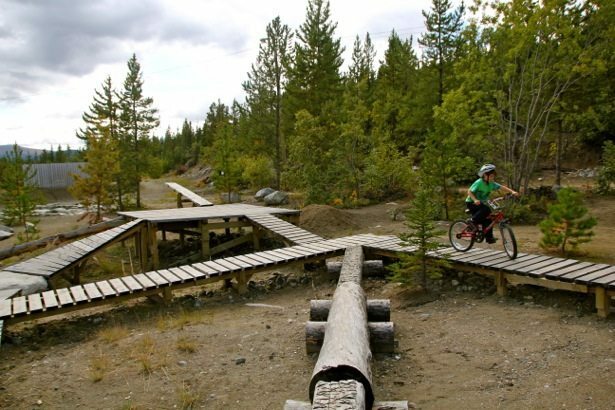 Whitehorse has been recognized as a top Mountain Biking destination by Outside Magazine and is consistently written up by various bike magazines. Living in the middle of 500 miles of trails that are a mix of single track, double track and old animal trails, makes us a bit spoiled. 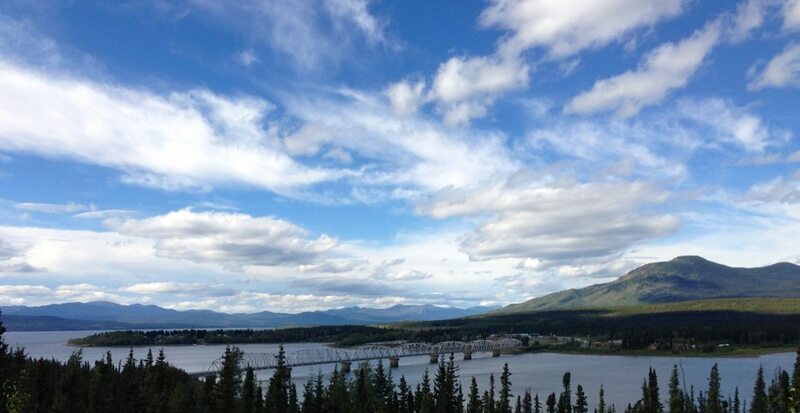 The trail system in Whitehorse and Carcross has been built through tremendous investment of time, energy and money by locals and various government programs. The end result is a comprehensive network of trails that has something for every level of rider. We even have our own skills park with jumps, ramps, skinnies and a pump track. 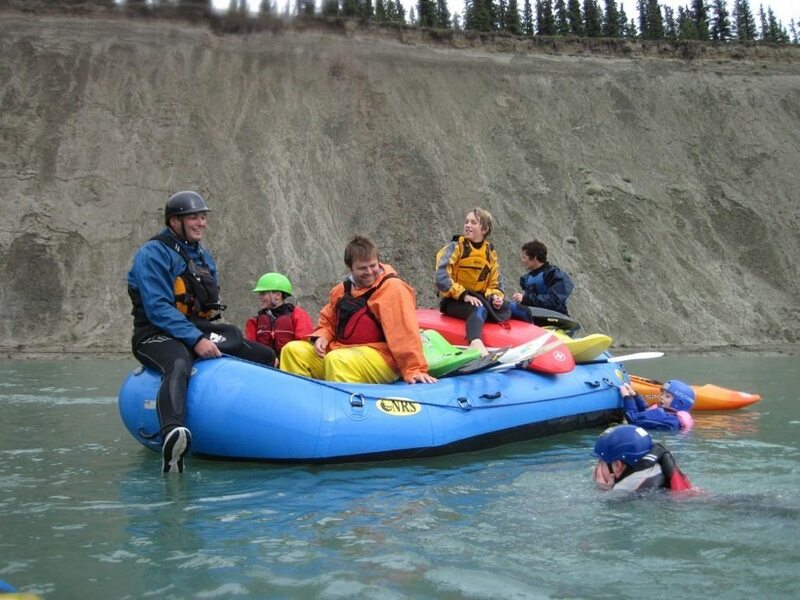 The three main trail locations are Mount Mcintyre (a world class cross country ski facility in the winter), Grey Mountain and Montana Mountain in Carcross. With all of this just outside our door, we have been lucky to bike at least 2-3 times a week all summer long. 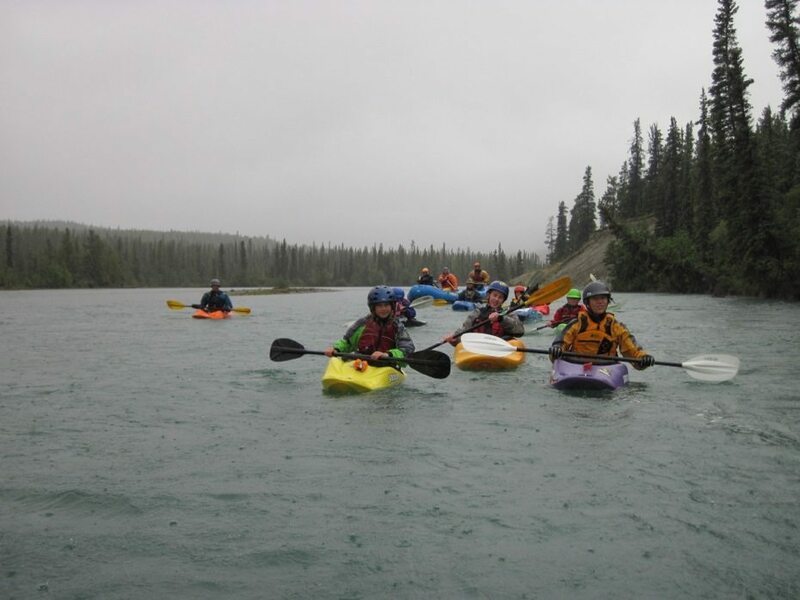 We spent 4 days at the Lapie River in the central Yukon camping and whitewater kayaking. It was also adventure test trip #1 to work out the bugs and start the lists in earnest (what do we need to figure out or do over the next 8 weeks before we hit the road for 8 months). 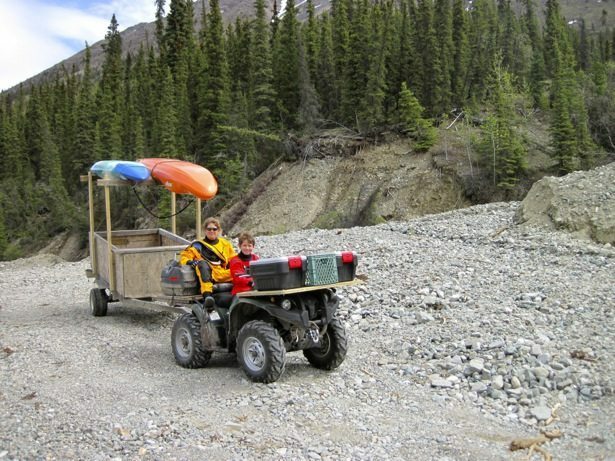 1 ATV for shuttling etc. 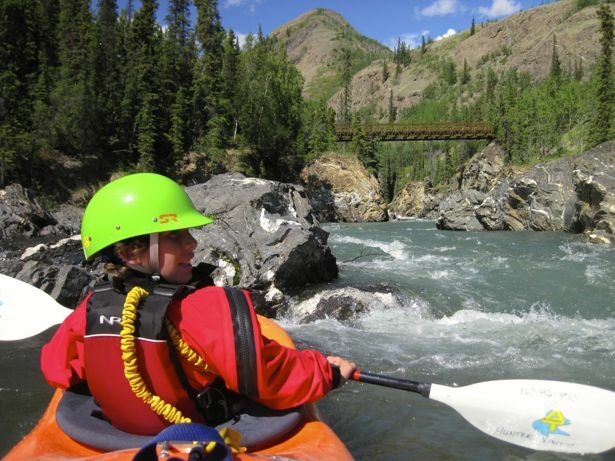 Our first day on the river was sunny and 30c – woo hoo summer! We ran the lower river section with Tim & Hunter in the Duo to help Hunter read and scout the river as we were hopeful he could run it on his own. Fabulous water levels made for a really fun day. Below is the view of the canyon looking upstream after we put in. 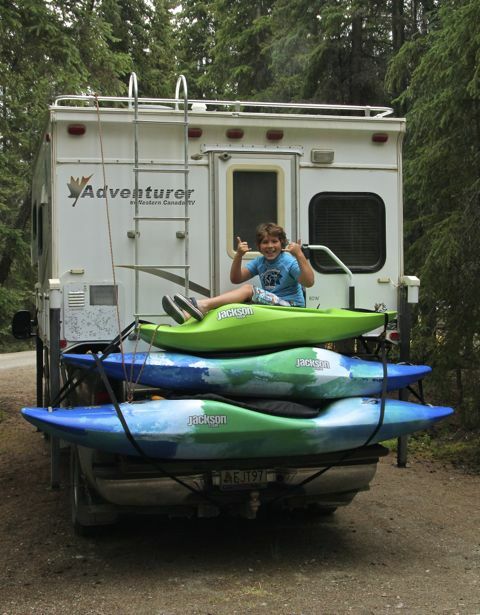 Fridge issues in the camper caused some frustrations– we’ve tried every setting and still get 10c on the thermometer. To avoid food spoilage we hooked it up to the generator for a few hours to try to get things back down to a better range but we’re stumped as to why the propane isn’t working. 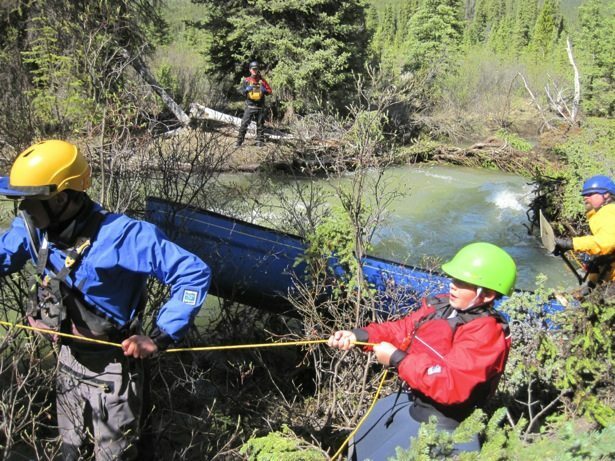 Day three on the river we ran the lower section with a group of tandem and solo canoeists. It was a group of 9 in total. I was definitely worried about Hunter’s ability to focus but he pulled it off and stuck with coach Dad. Some stressful moments when I found him sitting in the one of the surfing lines in the eddy – I thought he was just in the wrong spot, and then he peeled out to surf the wave without anyone ready in case of a swim! He wondered why I was so stressed… Run #2 with no swims and lots of enthusiasm – he even wanted to head off to a nearby lake to practice his roll! The fridge is still an issue – we’ve tried the highest setting & the lowest and neither are making a dent. Back to the generator for a few hours to cool things off and we made cookies to create an excuse to drink the milk! 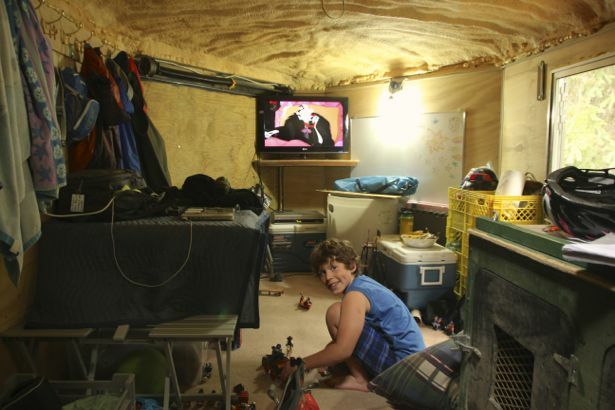 The boys also tested out their “Man Cave” set up in the trailer. They have set up a carpeted play zone in the front third of the trailer that provides a place for Hunter’s Playmobil, Lego & Trucks along with the bean bag chair and DVD player/flat screen. 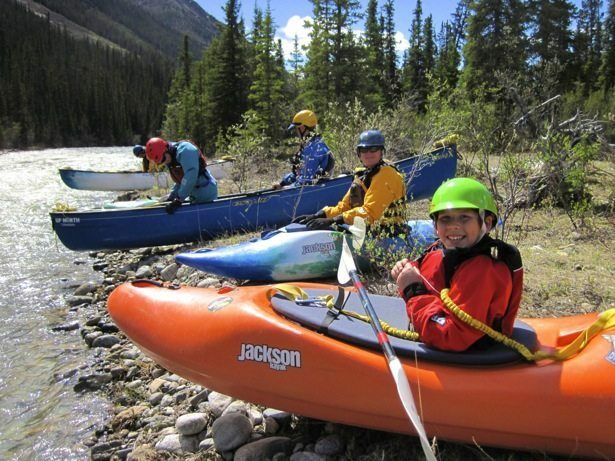 In between paddling we fit in some biking and visiting with other paddlers. A great 4 day adventure that we will definitely repeat next year. 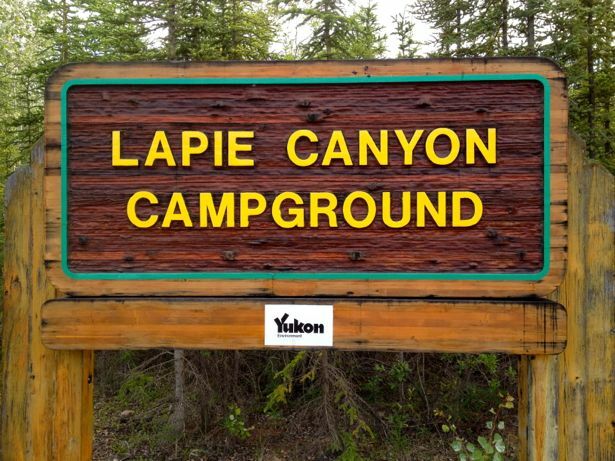 The territorial campground is a great resource and well set up for families with lots of space, easy walking trails, a covered cooking area and take out for the lower section is right at the campground.